Blackmores Pregnancy Iron has been developed specifically for pregnant women containing iron as the only active ingredient. It may assist in the management of dietary iron deficiency and contains a special low nausea, low constipation form of iron that is gentle on the digestive system. 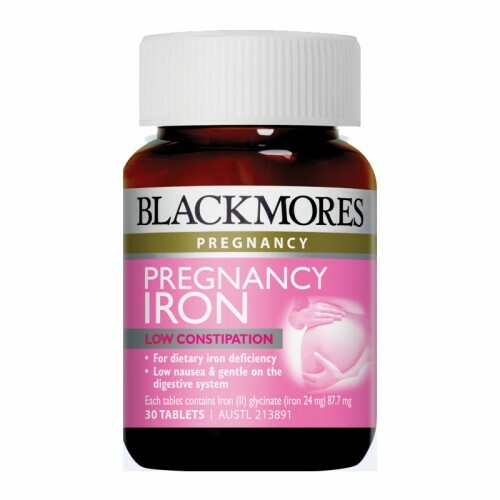 Blackmores Pregnancy Iron has been formulated with iron bisglycinate a low constipation, low nausea form of iron that is well tolerated and gentle on the digestive system. This form of iron is better absorbed than some other forms of iron including ferrous sulphate, when taken with food. Consult your healthcare professional before taking with any other product containing iron. This product may interfere with other medications you may be taking. Iron may decrease the absorption and efficacy of methyldopa, carbidopa, levodopa, thyroid hormones, penicillamine, tetracycline or quinolone antibiotics or biphosphonates. Doses should be separated by at least 2 hours.